Looking for advice on natural health and wellbeing? Your local independent health store can offer a wealth of knowledge and expertise. 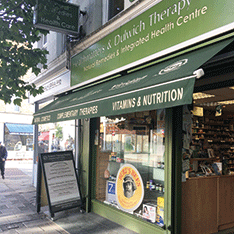 This month we speak to Monica McSherry, co-owner of Healthmatters in East Dulwich, London. There is an enormous range of organic products that are now available from independent health stores. Most dried foods such as fruit, seeds, nuts and cereals are organic. You can also buy organic honey, nut and seed butters, jams and organic drinks including herbal teas and coffee in store. In addition, organic skincare ranges are also coming into store. Many brands are natural and organic certified by Ecocert – the European organic certification body. Organic food and skincare products are also certified organic by the Soil Association. You can quickly tell if a product is organic by looking out for the certification logo from Ecocert or the Soil Association on packaging. The organic produce that is most popular with our customers is pre-packed foods such as seeds, nuts, dried fruit and cereals including pasta. Our customers know that we will not stock food ranges if they are not organic and this offers immediate assurance that what they’re buying in store is good for both them and for the planet. We’re seeing a big demand for organic food produce and although we do receive enquiries about natural and organic skincare, it’s organic food that our customers especially come into the store to buy regularly. This increased demand for organic food is also reflected in the Soil Association’s Organic Market Report which shows big increases in sales of organic cereals, tea, jams and spreads so far in 2016. By buying organic you can be sure of what’s in your food as all organic food is fully traceable. By choosing organic you will also be reducing your exposure to potentially harmful herbicides, pesticides and toxic metals. Organic food is produced with natural fertilisers from plants, it uses less energy and by choosing to buy organic you are working with nature, not against it. Research published in the British Journal of Nutrition also found there are significant nutritional differences between organic and non-organic farming. Organic crops such as cereals, fruits and vegetables were shown to be up to 60 per cent higher in key antioxidants than conventionally-grown ones. Eating organic is an excellent preventative to maintaining good health and wellbeing and it can also help to improve how you generally feel. A number of our customers have found eating organic has helped to improve digestive issues, for example. If you’re thinking of going organic and buying organic produce for the first time – local farmers markets, your local greengrocers or your local independent health store are all great places to start. Organic dried fruit, seeds and nuts can be a good introduction to buying organic in store. From there, you can expand into buying organic cereals, pastas, spreads, jams and drinks when you’re ready. If you feel a little bewildered at the wide range of organic products on the shelves of your local health food store, just ask a member of staff for advice. They’ll be happy to help. Healthmatters is owned by Monica and her brother Rob, and the store first opened its doors in July 2000. It now stocks over 1,000 products including organic, gluten-free, free from and paleo-friendly foods. The store also offers a dried herb section, natural and organic skincare and a wide range of supplements. Healthmatters is open seven days a week and the 10-strong team each has a natural health background including nutritional therapy, complementary health, homeopathy and osteopathy. A member of the team is always on hand to provide advice in store.